In addition to the discs of a more classical style listed on the other discography pages, I played as a session musician on a number of CD’s, some as a musician in The London Session Orchestra. As well as those listed below I have also recorded for Sting, Page and Plant, Bjork, Madonna ( Brixton Academy Live) The Spice Girls….. The experience of working and recording with many of these artists was intriguing. What struck me on so many occasions about so many of them was how sincerely grateful and humble they were in working alongside more ‘classical’ artists. One could be forgiven for imagining ( given their fame) that interest in engaging with musicians in our field would be something of a sideshow; on the contrary, input was often requested and advice sought ( Eric Clapton, Bryan Ferry, and Massive Attack spring to mind) making for a real sense of contribution from our perspective. The Wolf Hall recording (listed elsewhere on this site) was another example of that, not only in working with the wonderful composer Debbie Wiseman, but the distinguished Director, Peter Kosminsky also seeking our opinion on style and colour to suit a particular scene or mood. 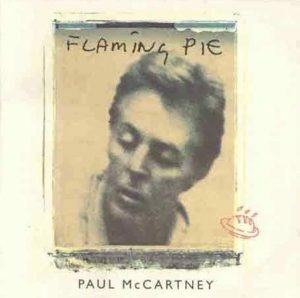 According to Paul McCartney, working on the Beatles Anthology project inspired him to record an album that was stripped-back, immediate, and fun, one less studied and produced than most of his recent work. In many ways, Flaming Pie fulfills those goals. 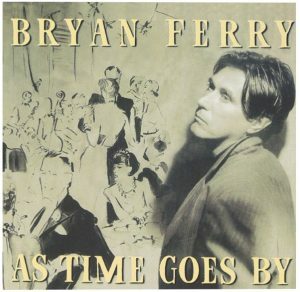 As Time Goes By is Bryan Ferry’s first classicist album, containing non-ironic, neo-traditionalist arrangements of songs associated with the ’30s. That doesn’t mean it’s a lavish affair, dripping with lush orchestras — it’s considerably more intimate than that. Even when strings surface, they’re understated, part of a small live combo that supports Ferry throughout the record. Since outgrowing child prodigyhood, England’s celebrated concert violinist Nigel Kennedy has adopted an affable punk persona and taken to crossing over to most every cool musical genre he can lay his ears on. Usually when classical music icons make such bold forays, it seems to have more to do with vanity or greed than musicality — a squirmy-to-watch lesson in how ill-equipped such purebred show animals are to walk on the wild side. 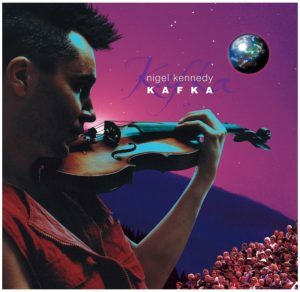 Nigel Kennedy’s Kafka — released in 1996,… is a glorious exception.Read on. Blue Lines, including Unfinished Sympathy. 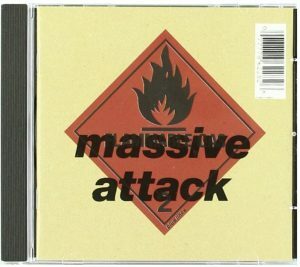 The first masterpiece of what was only termed trip-hop much later, Blue Lines filtered American hip-hop through the lens of British club culture, a stylish, nocturnal sense of scene that encompassed music from rare groove to dub to dance. The album balances dark, diva-led club jams along the lines of Soul II Soul with some of the best British rap (vocals and production) heard up to that point, occasionally on the same track. Read on. Former Pink Floyd guitarist David Gilmour is not prolific. 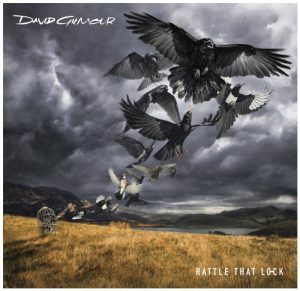 Rattle That Lock is only his fourth solo studio album (though it follows his late band’s final album, The Endless River, by only ten months). Gilmour recorded some 35 songs for this set, some dating back 18 years. Trimming them to ten couldn’t have been easy.Read on. 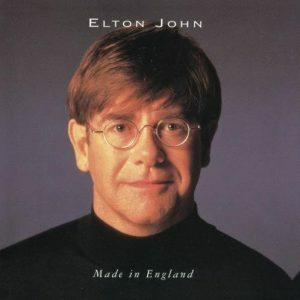 Made in England could as easily be the follow-up to Elton John’s self-titled 1970 album as his first recording since the success of his songs for the Lion King soundtrack. John has brought back some of his old associates, including percussionist Ray Cooper, guitarist Davey Johnstone, and, particularly, orchestrator Paul Buckmaster, who gave the Elton John album its distinctive sound 25 years ago and contributes four string charts here. Read on. 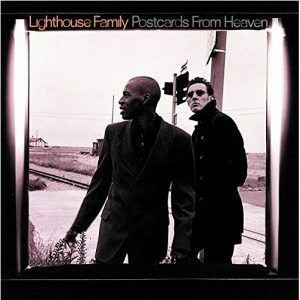 Although Postcards from Heaven, the second album from the Lighthouse Family, lacks any single as effortlessly graceful as its predcessors’ “Lifted” or “Ocean Drive,” it’s a stronger record, demonstrating that the group has a talented for well-crafted, complex pop. It’s a subtle, seductive record, where the details are nearly as important as the charming melodies. This time around, the songs reveal their pleasures with repeated listens, even though the music remains appealling and accessible. The difference is that the album doens’t have the immediate pleasures of “Lifted” — it has pleasures that take a little more time to assimilate but in the end, they are ultimately more rewarding. 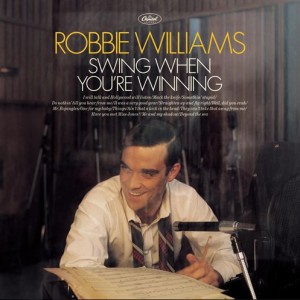 Performance dynamo and chameleonic entertainment personality Robbie Williams made a rapid transformation — from English football hooligan to dapper saloon singer — for his fourth LP, Swing When You’re Winning. Still, Williams’ tribute to the great American songbook is a surprisingly natural fit with its intended target: ’50s trad-pop patriarchs like Frank Sinatra and Dean Martin. And just like those two loveable rogues, Williams has brawled and boozed in the past, but isn’t afraid to wear his heart on his sleeve; in fact, he’s one of the few modern pop stars to fully embrace affecting balladry and nuanced singing. Read on. 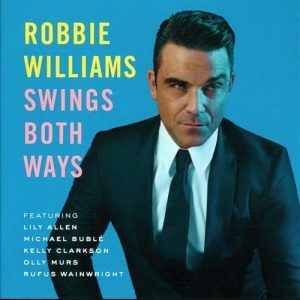 Swings Both Ways earnt Robbie his 11th UK number one album and the UK’s 1,000th, taking the top spot a whole 999 releases after Frank Sinatra’s Songs For Swingin’ Lovers became the first ever album to occupy that much-coveted position. 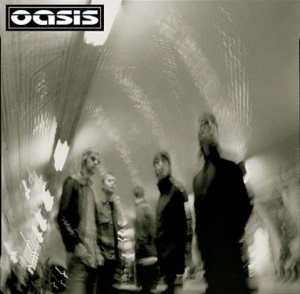 “Whatever” actually sounds more like “I Am the Walrus” than their actual cover (!) what with the strings, but it’s another solid pop single, with a shockingly perfect bridge; a nice progression. It makes one think that the first two singles, “Supersonic” and “Shakermaker,” which were good upon release, now seem naive in comparison. 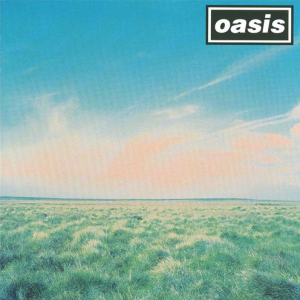 The B-side cuts here include one more in the “Listen Up” vein “(It’s Good) To Be Free,” and the Noel-sung, acoustic-pretty “Half the World Away,” which reminds a little of R.E.M.’s pre-Monster ’90s lovely stuff. But what’s the point of putting the LP’s (admittedly delicious) “Fade Away” here too? Eric Clapton reached the peak of his popularity in the ’90s, as the back-to-back number one albums Unplugged and From the Cradle combined for a total of over 13 million sales in the U.S. alone. 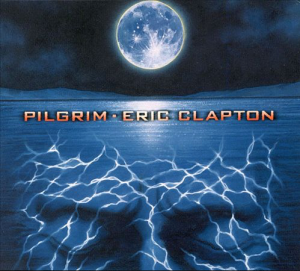 One strange thing about Clapton’s ’90s success is that it relied almost entirely on covers and new versions of classic hits; he released no albums of new material between 1989’s Journeyman and 1998’s Pilgrim. In the decade between the two albums, he had two new hits — his moving elegy to his deceased son, “Tears in Heaven,” and the slick contemporary soul of the Babyface-written “Change the World” — and Pilgrim tries to reach a middle ground between these two extremes, balancing tortured lyrics with smooth sonic surfaces. Collecting most of Jamiroquai’s singles since lead singer Jay Kay first donned a large furry buffalo hat for the band’s 1992 debut, Emergency on Planet Earth, High Times: Singles 1992-2006 is a superb listen and a great summation of what has made the retro-futurist funk band so successful. 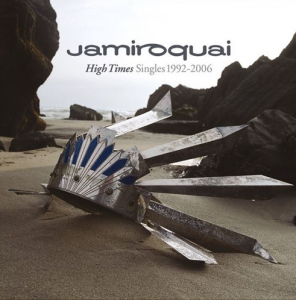 Sure, High Times doesn’t include every single they released — the fantastic “Light Years” and “You Give Me Something” aren’t included — and admittedly it was largely put together to fulfill and finish off Jamiroquai’s contract with Sony. Nonetheless, as an encapsulation of what makes Jamiroquai such a phenomenal pop-funk-dance entity, it’s an infectiously listenable affair. Read on. 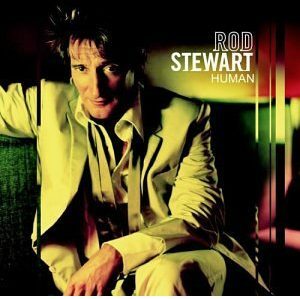 Throughout his career, Rod Stewart has been remarkably skillful at adopting current musical trends, whether it was disco, new wave, adult contemporary, or even Brit-pop. Still, his records started to slip off the radar screen toward the end of the ’90s, so he parted ways with Warner Bros. and signed to Atlantic, where he released Human in early 2001. Again, he tried to change with the times, which, theoretically, may have been a wise move….Read on. 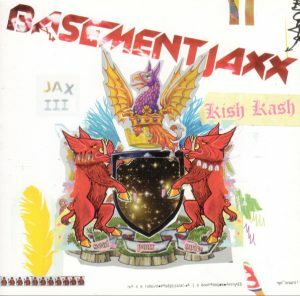 With two full-length masterpieces behind them, Basement Jaxx still hadn’t recorded a bum note, nearly ten years after getting together. But while their third record, Kish Kash, is still miles ahead of the various formula relied upon by scores of dance producers, it isn’t the same filler-free party classic as Remedy and Rooty. In fact, it reveals..Read on. Freed from her lawsuits, separated from the managerial control of her father, and now an adult, LeAnn Rimes redefines herself as a mainstream pop vocalist with Twisted Angel. If the title and the tarted-up sultry photographs didn’t offer a clue that Rimes is no longer a country vocalist, the very first cut immediately offers proof that she’s positioning herself somewhere between grown-up dance-pop and youthful adult contemporary. Read on.